The accumulation of static charges during the fueling transfer process can lead to costly explosions, fire and personnel injury. 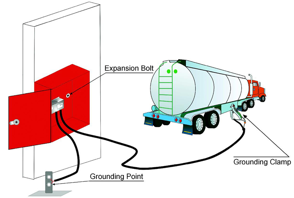 The Static Grounding Clamp with Alarm is designed to dissipate static accumulation and verify proper grounding. It is intrinsically safe for use in hazardous locations. 5m (16.4ft.) cable for one clamp. 3m (9.8ft.) for the other clamp. 5m (16.4ft.) cable for the clamp. 3m (9.8ft.) for ground cable.